The best couple of con artists in contemporary fiction are back in this excellent new installment of the Traveling Man series by standout author Michael P. King. This is inventive noir fiction at its best as the Travelers, this time operating under the alias of George and Roslyn Harrison, try to shake down a philandering politician. Two months pass and Honeycutt’s wife, Billie, discovers the $10,000-a-month payouts. Filled with suspicion, she hires a private detective, who trails Honeycutt and Roslyn to a vacant home and gets pictures — again, in a compromising position. Confronted by his wife with the new evidence, Honeycutt breaks down and confesses to his many sins. Sheepishly, he produces the first set of incriminating photos and DVD. It’s a political disaster in the making, with the primary only three months away. But luckily, Billie’s former brother-in-law just happens to be the county sheriff and promises to catch the blackmailer, while Honeycutt phones Roslyn, in front of his wife, to break it off. However, George, ever the cool con, devises a backup plan to bring in additional revenue from the ashes of his original scheme. It’s a twisting, ever-evolving plot that pits the Travelers first against the prospective candidate, then against wily Sheriff Teardale, then against persistent P.I.s, then smack up against circumstances absolutely no one could have foreseen. Where does it all end? This is the stuff of a first-rate three-act play on Broadway. Seriously. The superb writing and flawless dialogue carry the reader along, guessing til the very final curtain falls. And you won’t easily figure out how it all resolves. But it’s great fun trying. 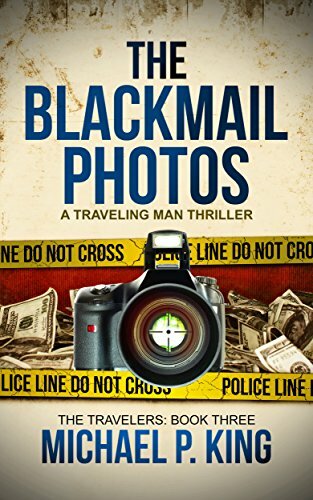 Five-plus stars to The Blackmail Photos. Author Michael P. King has outdone himself on this one.